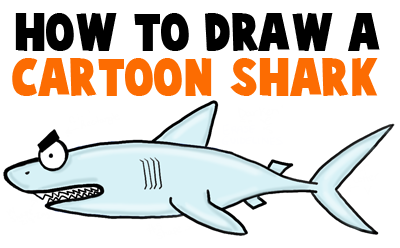 Today I will show you how to draw a cartoon shark with easy to follow, step by step illustrated instructions. I will guide you to draw a cute cartoon shark with alphabet letters, simple geometric shapes, and numbers. This is a great drawing lesson for young kids, older children, teens, and adults alike. Have fun! – Draw a letter ‘s’ shape at the front of the oval. – Draw an upside down letter ‘v’ shape at the top of the oval. – Draw a circle with a dot inside of it. – Draw 2 inward curved lines for the tail. – Draw zig-zag lines for teeth. – Draw a sideways capital letter ‘D’ shape for the nostril. – Draw backwards letter ‘C’ like shapes for gills. – Draw a sideways letter ‘v’ shape for the tail. – Draw a rectangle that is on a slight angle for the eyebrow. – Draw a #5-like shape for the fin. – Draw a sideways letter ‘v’ shape for the back fin. Finish up the shark by erasing guidelines and thickening or darkening the lines of the shark. I hope that you were able to draw the shark. Come back for more tutorials soon. This article was written on 09 Mar 2014, and is filled under Drawing for Kids & Preschoolers, Water Creatures.